The German government wants to send over 100 troops to train Kurds fighting against the Islamic State in northern Iraq. Should the plan be approved by the parliament, it would require changes in the supreme law to reverse the strict military policy. Chancellor Angela Merkel’s government is considering a plan of further support of the Kurdish Peshmerga forces, which are battling Islamic State (formerly known as ISIS/ISIL) militants. According to local media, at the beginning of 2015 over a hundred German soldiers from the Bundeswehr could be involved in an extended mission in Iraq that includes training on mine location and disposal technology. Defense Minister Ursula von der Leyen, Foreign Minister Frank-Walter Steinmeier, Interior Minister Thomas de Maizière and Justice Minister Heiko Maas, responsible for the draft of the plan, had a secret meeting on Thursday to discuss it, Bild newspaper reported. The cabinet is set to discuss the bill that may raise the question of a constitutional change on December 17. 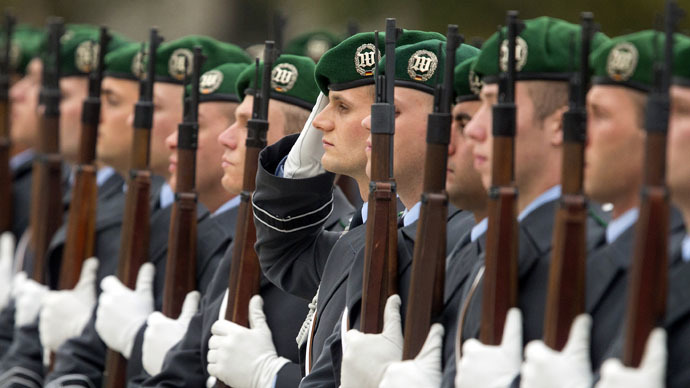 German Basic Law has strict limits on military involvement since the end of World War II, originally destined to prevent a revival of Nazi crimes. Currently, in case of a parliamentary approval, the German military is permitted to participate in missions that either have an international mandate from the UN, or as part of NATO. Alongside international forces, the Bundeswehr has already taken part in operations in Afghanistan, Kosovo, Mali, and other regions. The recent plan also won’t be approved without the parliamentary vote, so the final decision won’t be made until mid-January. The military intervention that requires a change in the Constitution in Germany requires a two-thirds majority in the national parliament, the Bundestag, and a simple majority in the Bundesrat. The Iraqi mission has turned out to be quite embarrassing for the German government. It started with humanitarian aid, but later, after a lengthy and heated debate, the government decided to help with an extensive weapons delivery. Its €70 million shipment of arms to the Kurdish town Erbil in September was stuck on the ground for several days due to several aircraft breakdowns. The military trainers also had a delay in Bulgaria, as they had problems both with paperwork and aircraft. Merkel’s Christian Democrats stated that the plan is principle for the success of the fight against the IS. MP Andreas Schockenhoff urged that the deployment must be “in a sense real and worth of a mandate,” according to dpa news agency. “The Iraqi mission is a good opportunity to think over the policy, because Bundeswehr is likely to meet even less national requirements in the future,” he said. The SPD, a member party of the so-called German grand coalition, remains reserved about further involvement in Iraq, though backing the necessity of parliamentary approval of the plan. SPD’s Rainer Arnold told Zeit newspaper, “This could also possibly present a bilateral agreement with Iraq”, talking on a collective security system establishment. The plan is regarded as problematic by the Left Party, but it has found support of the Greens, though the party calls for a mandate from the UN Security Council or a resolution of the UN General Assembly, according to Zeit. “At the moment, a training mission in Iraq is fundamentally rational”, said MP Omid Nouripour, the Green party’s speaker, dpa reports. Yet he added that "It goes about the deployment of Bundeswehr soldiers in one of the most dangerous regions in the world."